I came across an amazing article by David Siteman Garland about how to Interview & Build Relationships With The Most “Influential” People In The World. I thought I’d take his 6 steps and show you how to Build relationships and close deals with the most influential and inaccessible people in the world through the game of golf! He begins his article talking about how important it is to build relationships with “influencers” in your industry and beyond. Especially if you want to build a strong personal brand and have massive success. Many times it seems impossible to get even 5-10 minutes of their time especially for the millennials just starting out in business. And even when you get the meeting it may be planned for two months from now. Right now, with your current strategy, what are the odds that you could have a one-on-one conversation with someone you are dying to open a new account with? Very little to non-existent, unless you happen to sit next to him or her on a plane, sit on one of the top boards in the nation or it’s one of your buddies parents, but for most of us it’s just a pipe dream. Or is it? What if I told you that by playing golf at the right clubs and tournaments across the nation, that I’ve had the opportunity (since I started playing competitively at the age of 16) to spend 4.5+ hours with 3,4 and 5 Star Generals in the Navy and Marines, Fortune 500 CEOs, and I even passed Condoleezza Rice while walking up #9 at Cypress Point. And this was all because I took advantage of the golf invitations that have come my way over the years. And perhaps more importantly than the golf rounds themselves, is to know I have great relationships with all of the people I play golf with. People that can count on me when they need me and people I can count on when I need them. How did this happen? Better yet, how can you leverage these strategies to not only build quality relationships with influencers but to grow your business and brand? Here is the multi-step process I converted from David Siteman Garland’s article and the principles to, essentially, get in contact with and close deals on the golf course, with the people of influence in your industry. Social media has made modern influencers more accessible than ever, which I believe makes them much more guarded of their time. You are probably thinking to yourself, then how the heck will I get them to spend 4+ hours with me on the golf course. This is a great question and can only be answered by knowing what the influencer you want to spend time with values when it comes to the game. Everyone values something different, but it’s pretty easy to find out or even guess if you base it on skill level. The “a couple times a week” golfer or even a golfer with a handicap below a 20 will want an invite to a “difficult to get on” golf course. My dad, for example, was invited to play Augusta National a few years back by a friend and Real Estate Lawyer. They had a trip of a lifetime, and the least he could do for his buddy was to throw some business his way after the round. Here is a list of the top 100 golf courses to get on. If you have access through your company or friends, it might be worth your time to make the connection for some of the big fish in your pipeline. Both avid and social golfers will want to play in a tournament that is raising money for a cause they support. You may have to do some digging to figure that out, but it’s well the time. The influencers might also want an invite to a charity tournament that has a reputation for being a blast. Especially if it’s sold out. The newbie to golf (mostly my clients) love when I invite them out for a swing or on course playing lesson. Many newbies will be intimidated by playing nice courses because they feel like they will make a fool of themselves. I’ve taken VP’s of Fortune 500 companies out to play 9 because they’ve been dying to take a lesson! What’s even better is that it’s affordable. A round of golf at an executive course is around $20 and a bucket of balls around $10. Once you have identified what their interests are, just ask. If they are busy this time, ask them again, because getting out on the golf course with a prospect or client can be a fast track to more business! If you aren’t ready to invite people out to the course, go where the influencers are already playing. A friend of mine Jimmy Langley hosts this thing called the Hackers Cup every quarter. It started out as a way for him to get all of his buddies together to play golf, but now it’s a great way for him and others to make solid connections for their businesses while having fun! I also attend charity events put on by Associations that I know my prospects and clients will be attending. It’s even better when the vendors (hole sponsors) are your clients. So as you play, you get to catch up with them on each hole and show them your support! If you have the means to join a private golf club, do it! Joining a club is the best way to meet other savvy business men and women while having a place to bring your clients that will impress them. If you aren’t quite ready to play in a tournament, attend as a spectator. I caddied for my friend Heidi at the Farmers Insurance Open last year and ended up meeting the CEO of Farmers in the Lodge bar that evening. We are still working on finding the right fit for our businesses, but it was well worth my time that day to meet him. These are the new rankings for the top 10 golf courses in the US. If you are lucky enough to be a member or get invited to play, you just might see a past president, a few well know business moguls and well a bunch of unknown millionaires. Having played these courses gives you a “well, who do you know” status that for a moment might give you a little extra credibility! It also makes a lot of people jealous, so be careful who you flaunt it around. Too often, people will try to close business on the course. The golf round is best spent getting to know your prospect or client and building a stronger bond between the two of you. When I’m out on the course, I start the first couple of holes asking questions about where they golf, their clubs, where they are from, where they went to college, current events, etc. Then between the 4th and 12th holes I might ask questions to qualify or get more intel on their business and readiness to buy but I am still working on having fun and building a stronger connection. Then after the 12th hole until we go into the clubhouse, I’ll switch back to talking about holidays coming up, family, and any fun out of work events they are attending. Only when we get to the clubhouse or the 19th Hole, will I bring up next steps. An example could be, over a beer or glass of wine, wow that was such a fun round, we should do it again soon, but in the meantime I’d love to sit down and see if there are any synergies with us working together. Is there a good time that works for you next week? I’ve also had clients say at the end of a round, Gosh Jenn, that was a blast, I’m swamped through the end of the year, but let’s grab coffee in January and lay out a plan of events for 2016. If you focus on inviting the right people out for golf and building relationships while on the course instead of trying to close a deal, I assure you, more often than not the business will follow. You could invite someone to the #1 golf course in the nation (Augusta National) but if you don’t exhibit good etiquette on the course, you could still blow the deal. Etiquette is the thing that will either have your “influencer” wanting to play another round with you or never to want to spend another second with you. I will put a small disclaimer here – having good etiquette will not win over all of your playing partners, but it will give you a chance for your personality to shine. Bad etiquette will assure that you never get to do business together. Let me give you a quick example. Let’s say I’m out with the sales director in charge of purchasing whom I’d love to do business. He’s an avid golfer but also very patient. We get to the first green, and I’m going to grab my ball out of the cup when I step all over his putting line. He might not say anything out loud, but inside he’s cringing, and right now I’m at strike one. The next hole I hit it in the woods and can’t find my ball, so I decide to drop one in the fairway and hit it on the green. I 2-putt and give myself a five on the hole. Now he thinks I’m a cheater, and my chances of ever getting to play golf with him let alone do business with him are over. This may seem pretty scary for new golfers. You don’t want to make a fool of yourself and never get invited back to the course, so you might opt out of playing altogether. This is a big mistake. Instead of opting out, spend the next 30 minutes reading my Newbies Guide to Golf Ebook, that covers how to handle different personalities out on the course, the top pieces of etiquette to know, what to wear and when to talk business. So, If you’d like more info about exhibiting integrity and following good business golf etiquette, text NEWBIESGUIDE to 22444 for your free Newbies Guide to Golf E-book. Staying in front of someone without being annoying is also critical to forming relationships. After your golf round, you will want to stay in touch and also set up a follow-up meeting. Say, it was wonderful spending the day out on the course with you! I can’t believe we both went to the same alma mater! (or some other way you connected). I’d love to find out more about you and your company and see if we can help you with (value add) Let me know when you are free for a call or a coffee or to hit a bucket of balls (we all know I need the practice!) Best – Jenn P.S> So you can commemorate the day, here is a great pic of us out on the course! Send a gift or bring it to your meeting if they paid for the round! Invite them to other golf tournaments in the future or other fun events that will help them in their business. Send them pics of you golfing other courses you might have chatted about during your round. i.e. I went to play Pine Valley after speaking at the PGA Championship, so I sent the crew that invited me a thank you email with a pic from PV. The last thing you can do is send them congratulations when you hear about great things their company is doing in the media! If you aren’t quite ready to get out onto the course, being able to speak the golf lingo can still fare ye well. All you have to do is talk about the upcoming tournaments, or who is in the lead or ranked world number one at the moment. Last summer (2015) it was fun to watch Jordan Speith, Rory McIlroy and Jason Day pass the world #1 ranking back and forth! If you want to brush up on your golf history, click here. If you want to get the latest happenings in golf, sign up for Global Golf Post e-Magazine that is sent out each Monday! And if you’re not into reading, the Golf Channel’s Golf Central always has a great recap of the day in golf! If anything you will start to pick up the lingo after watching a few clips. You can also grab a copy of my e-book here by texting NEWBIESGUIDE to 22444. There are five pages of Jargon just waiting for you to read them! Even as our world changes and social media and online marketing change the way we do business, face to face time with clients and prospects will always be crucial to how business is done. 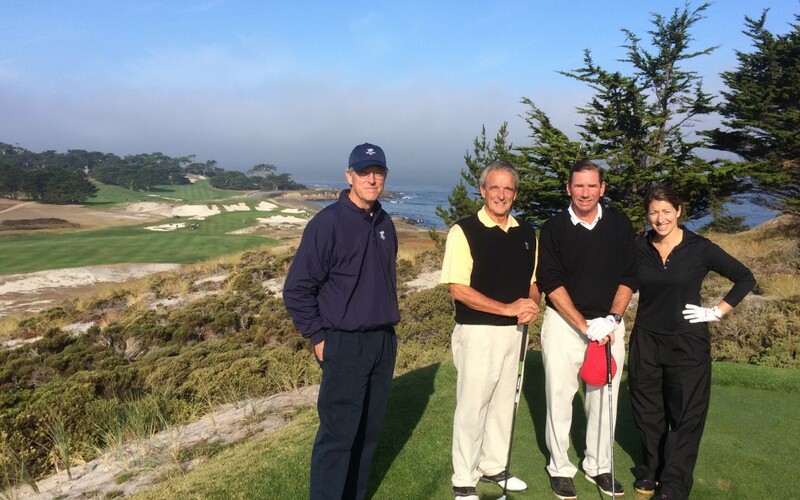 If you are in an industry where golf is an acceptable form of relationship building, I urge you to take advantage. And the best part of it all is that you don’t have to be great at the game to close deals on the course. If you practice good etiquette, provide value to your playing partners to entice them to join you for 4.5 hours and have a solid follow-up plan, you will be surprised at all of the magic that can happen!